And here's the finished model. I'm just doing the construction, this guy will most likely be shipped off to be painted by a pro. This turned out to be one of my favorite builds to date. I think he's got a great look and he's a custom build for a Salamander force. from the backpack to the small icon on his greave, everything fits and he's a good balance of clean areas and detail I think. 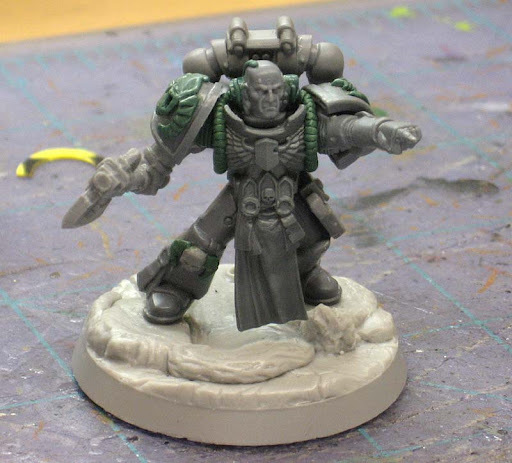 If I wasn't playing Deathing, I would have ordered the bits over and built one of these for my force. Librarians are just cool models. Very nicely done! Always nice to see people make some really unique figures by using putty and conversions. Do you plan to add anything to the backpack to add to his presence? Flekkzo: I think it would be cool to see an Imperial plastic Commander kit that allowed you the ability to build just about any "HQ" you needed. From Captians, to Chaplains or Librarians, all the bits would be in there. That would have some real value. CMDante: Nope, nothing else to this guy. He's been kept simple deliberately. No other "extras." He doesn't have all the bells and whistles like they do now. This guy is very much a soldier who takes the field without all the parade decorations. @Ron Exactly! That and a set with just weapons and veteran "stuff". How are they assuming people will get the 2-8 meltaguns that will be common in for instance Space Wolf armies? I guess order their metal ones (yes I am a plastic guy. Just like plastic better. ).